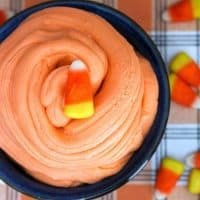 Celebrate Halloween with a batch of fun and taste-safe candy corn slime, made with actual candy corn! Some love it, some hate. But one thing is for sure — candy corn is the quintessential Halloween treat. This fun and easy-to-make Halloween slime can be made with just 5 ingredients: cornstarch, vanilla, marshmallows, and — you guessed it — candy corn. While I wouldn't suggest letting the little ones chow down on it, this candy corn slime is in fact edible. For me, I just like being able to rest assured that if one of the kids does sneak a taste, it won't cause them any harm — other than a possible sugar high. Don't miss this taste-safe apple cinnamon playdough! 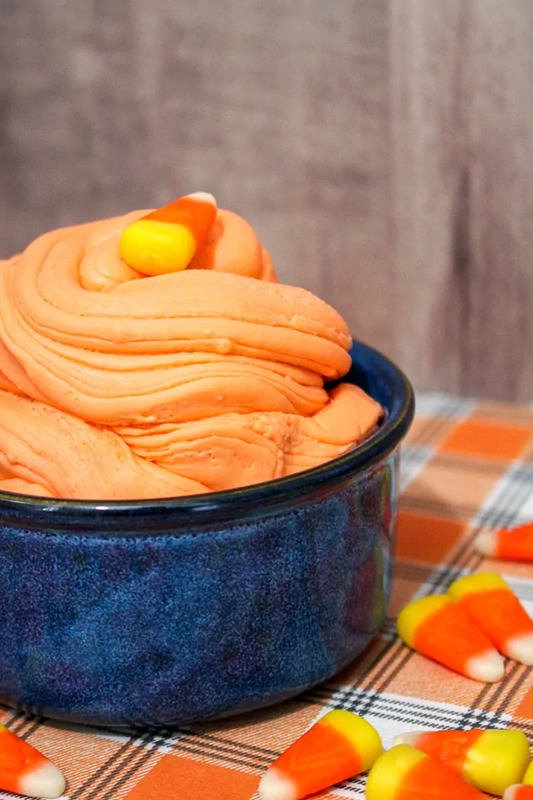 This Halloween slime recipe doesn't require any baking or cooking, other than some quick microwaving to melt the mini marshmallows and the candy corn. Other than that it is as simple as stirring and mixing. 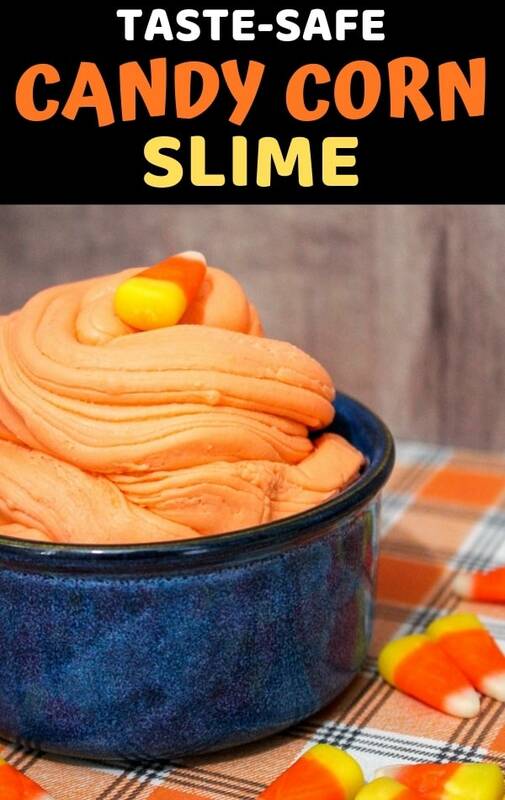 So between the pumpkin carving and Halloween treats, why not make a batch of this taste-safe slime with the kids? 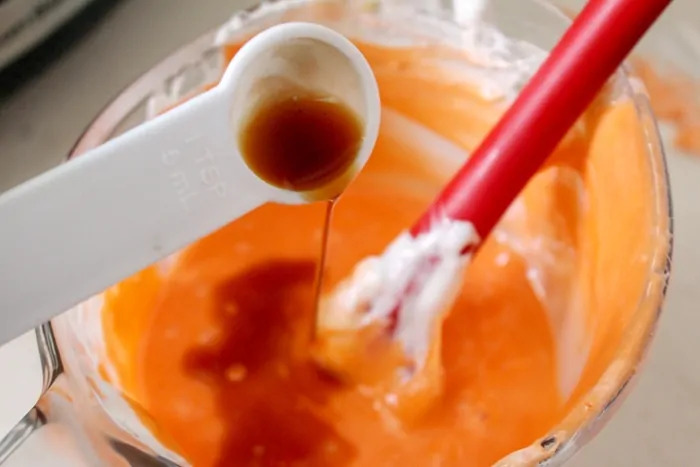 This easy-to-make slime would make for a great preschool or homeschool activity with the children. 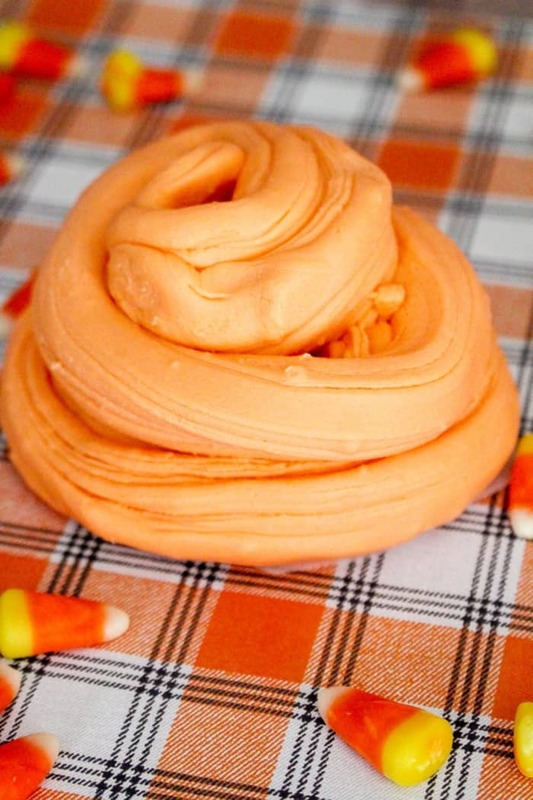 The kids will enjoy watching the candy melt and turn into slime. But be careful that the slime has cooled down enough before letting the kids get their hands in it – it will be hot coming out of the microwave! I hope that you and the kiddos enjoy this fun Fall sensory play activity! 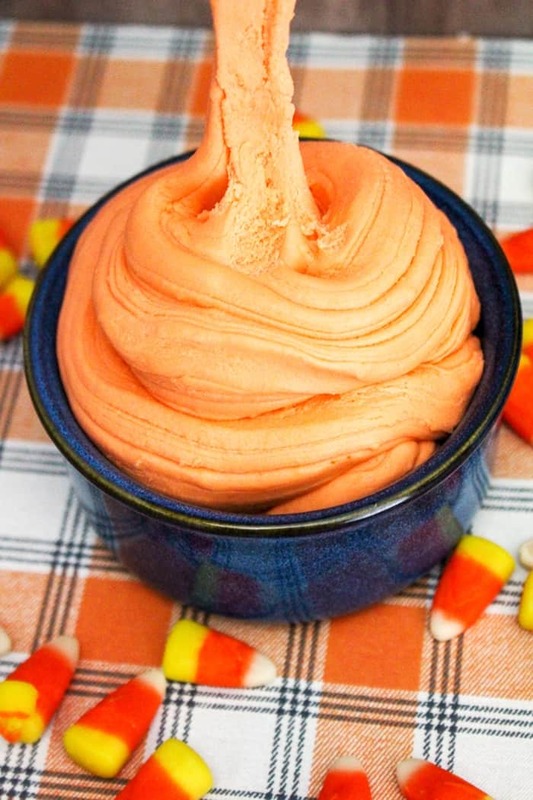 This taste-safe candy corn slime makes a great activity for Fall and Halloween sensory play. In a microwave safe bowl, microwave mini marshmallows until melted. 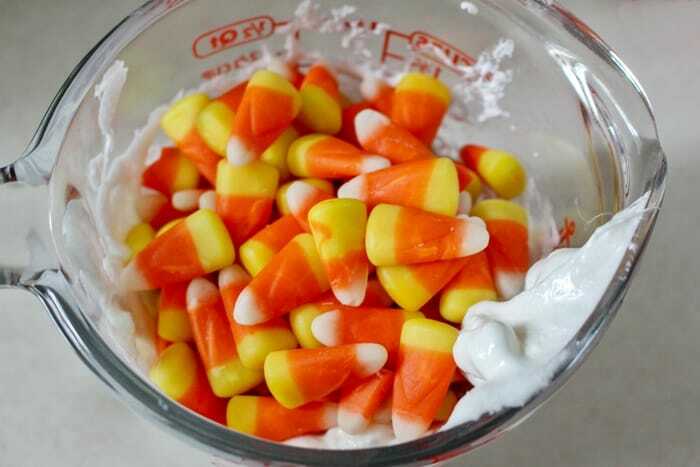 Then, add candy corn and microwave in short intervals until melted, stirring in between each interval. Add canola oil and vanilla. Stir until well combined. Slowly add powdered sugar, ¼ cup at a time. Once you have added 3/4 cups, remove slime from bowl and use hands to mix it together. Be careful, it may still be hot! Continue to add powdered sugar ¼ cup at a time until the consistency is where you would like it. A little more canola oil can be added in if you need to improve elasticity. The slime will be the most "slimy" while it is warm. If the slime begins to harden, microwave it for 30 seconds and it should soften up. Just be careful that it isn't too hot before giving it back to the kids! This is the coolest slime, taste safe. And ingredients easy to find! love it and super easy. What a fun project to do with kids. I’m afraid that *I’d* eat it. What a name, but it sounds good. Thanks for posting! When it hardens, does it become fudgy in consistency, or harder? Thanks for the info! Look forward to making this! Great question — It becomes harder, making it tough to play with. To get is softer and more “slimy” you can heat it in the microwave for a few seconds to get it to soften. I haven’t tried making slime with mini marshmallows! That is a cool idea.